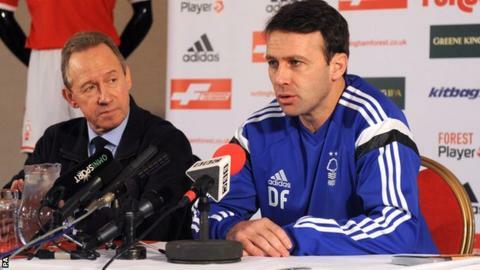 Nottingham Forest boss Dougie Freedman says he is "not a miracle worker" as he begins the task of arresting the Championship club's slump in form. Freedman replaced Stuart Pearce on Sunday, with the club in 12th place but seven points clear of the bottom three. "I'm not a miracle worker. I'm looking over my shoulder to make sure we win and start going up the table," he said. Meanwhile, it was announced that Pearce has declined the offer of an alternative role at the City Ground. Pearce, who spent 12 years at the club as a player and captain, was sacked after a run of six defeats in seven matches. Forest had led the division in mid-September. Freedman confirmed he has signed an 18-month contract, and will be joined by former Charlton boss Lennie Lawrence as his assistant after the pair previously teamed up at Bolton and Crystal Palace. "It's a fantastic opportunity to coach at a wonderful club with great history, a great squad and great facilities," added the Scot, who parted company with Bolton in October. "We've to start winning games of football - that's the goal and then we can get confidence back in the squad and all go in the right direction." Freedman will have to operate under a transfer embargo, but he insisted he is more than happy with the players he already has at his disposal. "It's a fantastic squad with good depth which is important in the Championship," he said. "These players were flying high at the start of the season and there's no reason they can't get back up there." Freedman's tenure will begin amid a degree of turmoil at the club, with the departure of Pearce - the fifth manager to leave during owner Fawaz Al-Hasawi's tenure - followed swiftly by chief executive Paul Faulkner's exit. "I'm a football manager and I love working with players: that is what I focus on," Freedman said. Meanwhile, Forest winger Djamel Abdoun has joined Belgian club Sporting Lokeren on loan for the rest of the season. The 28-year-old has not played for the club this season after making 27 appearances in the 2013-14 campaign following his arrival from Olympiakos.